I have not taken enough advantage of the express collections! 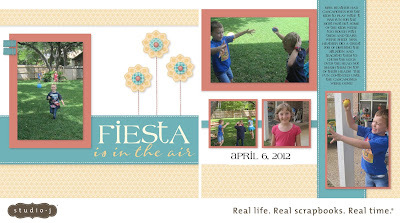 This page said Spring is in the Air, I changed it to Fiesta instead of Spring. I added my photos, journaling and the date and I am done. 5 minutes tops! I am actually going to add more photos to this layout with flip flaps too! Most have 11 layouts and they are fabulously creative and you just need to drop in photos and personalize the title and journaling! Check them out today! $5 for a 2 page layout until March 15! For every Studio J order during this sale you get an entry to win a Studio J 5 pack!